Spicy, nutty, sweet and salty. It is finally starting to cool off a bit in Florida. 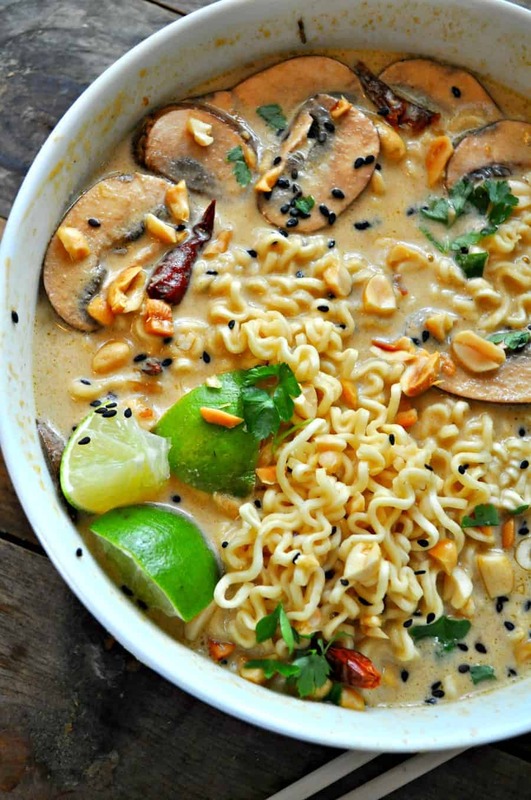 So, this vegan spicy Thai peanut ramen has been on repeat! The broth tastes a bit like a beautiful satay style peanut sauce. Which is one of my favorite things. 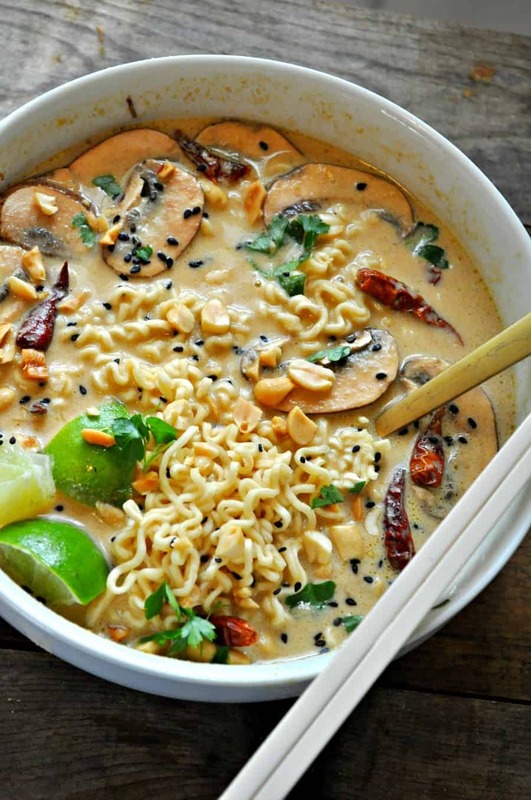 This Thai peanut ramen is so hearty and filling, but still doesn’t feel heavy. 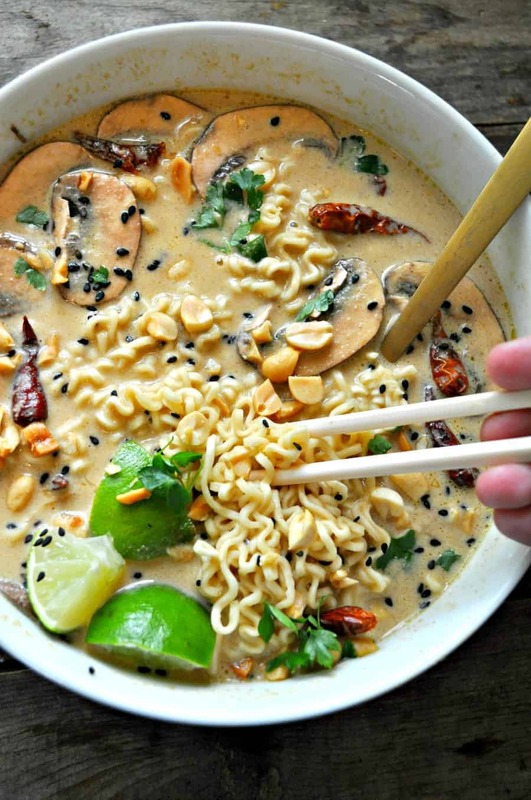 The spicy peanut broth is so incredibly flavorful, you could really eat it on it’s own. Or add all kinds of different things if you don’t want ramen noodles. Garlic, ginger, curry paste, peanut butter, soy sauce and lime juice make this broth so flavorful. The broth is just a simple veggie broth and coconut milk combination. It is one of the best things you will eat this fall and winter! So comfy and cozy. 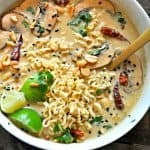 Another reason I love this vegan spicy Thai peanut ramen is because it is a one pot, super fast, super easy meal. I don’t think it could get much simpler than this ramen soup. Or more delicious! As far as the ramen noodles go, you can get regular packets of ramen and just toss the flavor packets in the trash. Most ramen noodles are vegan, by themselves. Just double check the ingredients of the brands that are at your store! This Vegan ramen soup is hands down the best ramen I have had. You can add whatever protein or veggies you have in the fridge, or just eat it as is with just broth and noodles. I love adding tofu and mushrooms! Whatever you add, you will have an amazing meal! 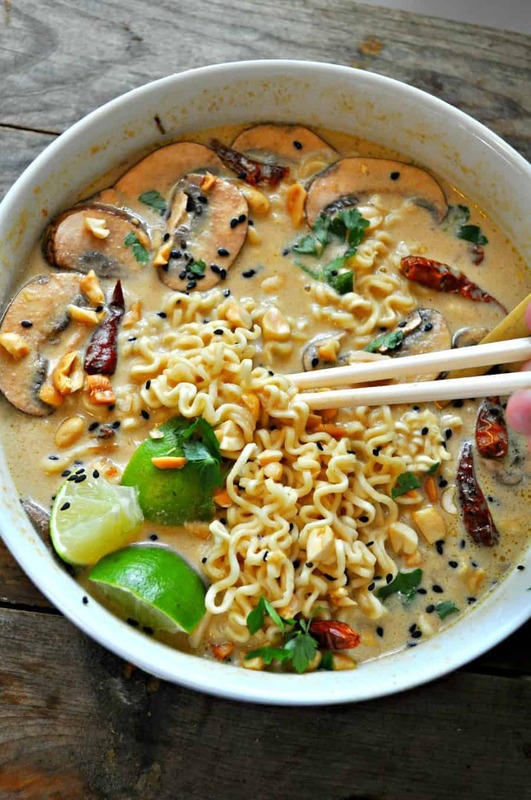 The best vegan ramen soup with a spicy Thai peanut broth. In a large pot, heat the olive oil on medium high. Then add the chopped garlic and grated ginger. Saute, reducing heat as needed for a minute or 2 to cook the garlic. Now, add the curry paste, and stir it into the garlic and ginger. Cook for another minute. Then add 3 cups of veggie broth and the coconut milk. Stir to combine everything. Reduce heat to low and simmer. Next, in a medium sized bowl, whisk together the remaining cup of broth and the peanut butter. I find this makes it easier to incorporate the peanut butter. Now, add the peanut butter and broth to the pot and whisk to combine. Then add the soy sauce, agave and lime juice. Simmer on low for 5-10 minutes to develop the flavors. Taste and adjust seasonings. Add a pinch of salt if needed or more lime juice or agave if needed. Right before serving, add the ramen noodles into the pot. Simmer them, cooking according to package directions. They usually only take a minute or two. Serve immediately as is, or add veggies or tofu or whatever you want. I like to top with cilantro and chopped peanuts. Make sure to add the noodles right before serving. If the noodles sit around in the broth they will get mushy. If you want to add mushrooms, slice them really thin and add right before serving as well. They will cook fast. I made this last night for dinner, because we saw the photo and were like um yes now thanks. Anyhow it was relatively quick to make, and was SUPER delish. Added some kimchee and green onions and we were set. Thanks for another amazing recipe Lauren! we had this for dinner tonight & it was great! thanks!! yummmmm! Made with lo mein noodles instead of ramen, was delicious and so quick to prepare! We loved it! Thanks! I don’t normally comment on recipes but I just have to thank you for this delicious meal. I followed the recipe except I doubled the lime juice and added chili oil and red pepper flakes. My veggies were mushrooms and red bell pepper, and I used extra firm tofu. I’m still sitting here licking my chops. So. Dang.Good. Like the kind of good that leaves you food high after. Definitely a keeper! This looks amazing! I usually try to meal prep on weekends for the week. How to make this last? Keep noodles separate until serving and then add noodles in sauce and put in microwave? Yes, I have been doing meal prep with this and I make the broth and keep the noodles separate. Then microwave with the noodles! Works great! Yesterday was chilly in the northeast . I went for a 3hour bike ride and was craving something warm ,light and filling. This was it!!! I added extra firm tofu To increase my protein for my cycling recovery. 2bowls later I’m filled and satisfied .super easy super quick and phenomenal depth of flavors!!! Thanks! Could this be made with red curry? Absolutely! Red curry would be great too! Made this with reduced fat coconut milk and red curry paste, as that was all we had in the cupboard and it was delicious! Still lovely and creamy too. This was so good and easy to make! Added red peppers, mushrooms and greens. Also used red curry. Delicious!! They are dried Asian chilies. I mostly just use them as a garnish, but they are the ones that are usually sauteed in General Tso dishes and other stir fry dishes. Do the red Asian chili peppers add spice to the soup? Nope, just garnish for the picture. I used red curry because I always have red curry in the house, and it was AMAZING! I added mushrooms, tofu, kimchee and broccoli. This is seriously my new favorite dish. I made it for myself one night and then the next night I made it again while I was home for my non-vegan fam and my mom basically licked the bowl! MAKE THIS!! This sounds delish! Are those sliced sweet potatoes in the picture? They are sliced mushrooms!! But you can add anything you want! 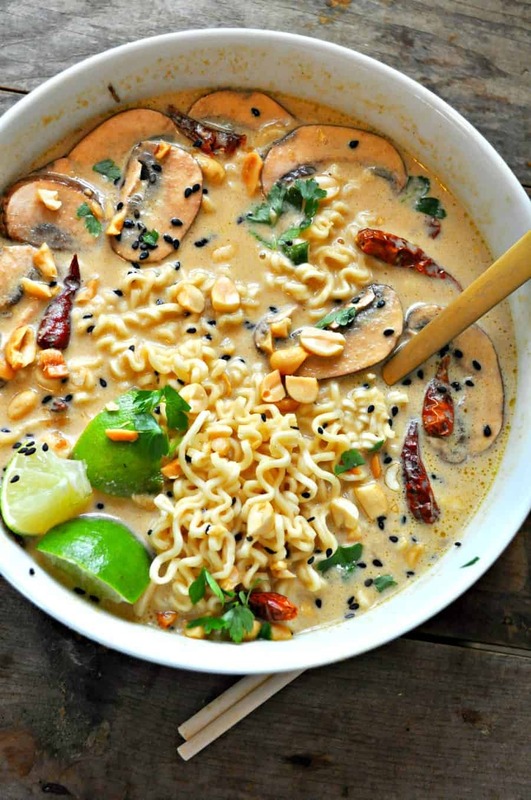 How long do I add mushrooms before noodles? WOuld it be weird to add egg to this?? Not at all, if you eat eggs, go for it! I bet it would be great! Hello! Can I substitute the agave with another sweetner, like honey? Or even just omit it? Sure, honey would work if you eat honey. You can totally omit it though. I just thought it needed a bit of sweetness, but you can decide! This sounds amazing! For someone with a peanut allergy do you think tahini would be a good replacement? Would love for everyone in my family to be able to have some! I think tahini would be great! Or you could try sunflower seed butter. I have also had a few people with peanut allergies say they used almond butter and loved it! I think tahini might be the closest in flavor though! Awesome thank you! Just went and got two things I needed to make it, can’t wait! I used tahini, & it was amazing! Wow! Made this tonight. So delicious. Used regular penut butter and didnt add the agave, Used black rice ramen. Added rapini, heirloom baby tomatoes, crimini mushrooms, cilamtro stalks. Topped with lime, green onion, cilantro and chili oil. Haha, I just did the servings based off of the ramen noodle package. Let’s be serious though, that is nonsense! It’s totally fine as a dinner and lunch for one. I do it all the time! Ahah I also missed that! And i ate half for dinner and half for lunch the next day. So good though. Maybe will share next time too. Maybe. Is this actually 12 ounces of noodles? Yes, that is correct. It is 4 small packages. You can always add more or less if you want though! Thanks! When I used that many noodles all the broth was soaked up so I wasn’t sure. The look of this makes me feel so hungry! Fantastic recipe and great photo! It reminds me of a tom kha soup I used to make, but that was with a coconut flavour. I definitely have to try this as soon as possible! Could this be made with rice noodles? And if I made a large batch over the weekend for weekday meals would it still taste OK? It looks so good. Thank you!! You can definitely use rice noodles. If you are making ahead of time, I recommend just adding the noodles you plan to eat, then adding more when you eat more. If the noodles sit in the broth for days they will absorb all the liquid and be mushy. This wasn’t “spicy” at all! Did I do something wrong? Irregardless, it was so delicious. Maybe I should add more green curry paste next time? I’m so glad you liked it! You can totally add more curry paste if it wasn’t spicy for you! Will surly try this😋 any helthy broth brand recomendation? I usually use Trader Joe’s brand! Could the curry paste be replaced with curry powder? It won’t be the same flavor, green curry paste has lemongrass, shallots, chilis, ginger and things like that. You can definitely try it out. However, if you are looking for something that is dry that is similar, I would go with some powdered ginger, cumin, coriander and maybe chili flakes. I followed the recipe, and it turned out really tasty, but the “broth” was too thick like a sauce. Did I do something wrong or is that just how it turns out? I thought about trying again with just half the PB and half the coconut milk. What would you suggest? Thanks! I’m not sure exactly what happened, but it should be nice and brothy. If it is too thick, I would recommend adding more veggie broth rather than reducing the other things. The only thing I can think of is the noodles absorbed too much of the liquid? However, if it happens again, I would just add more broth! Then just taste it to make sure the seasonings are still on point! I hope that helps, and thank you for the feedback!! I never comment on blog posts, but this was so amazing and I love that it is versatile. I just ate it a few hours ago and am already dreaming about having more! I doubled the curry paste and left out the agave. I added sauteed onions, yellow and red bell peppers, and broccoli right after throwing in the noodles. Added mushrooms at the last minute as suggested and followed everything else exactly. So so so good. 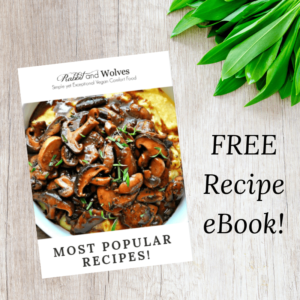 My husband had 3rds and he is not vegan 🙂 Thanks for an amazing recipe–I’ll definitely check out your other ones! They are black sesame seeds. This was by far the best and easiest ramen recipe I have ever made at home. I added miso paste and jalapeños and also cooked up some seitan “chicken” with the green curry paste and soy sauce and put that on top. Even my non-veg boyfriend loved it and can’t wait to make it again. This is an A++ recipe. Thank you! I’m so happy to hear that! All your additions sound AMAZING! This looks amazing! I am not a fan of ‘spicy’ though, how would this taste if I left out the green curry paste altogether? You can leave it out, but it may not be as flavorful. You could add just a tiny bit and it probably wouldn’t really be spicy at all. You could also substitute by using some of the ingredients that are usually in the curry paste and just leave out the peppers. Maybe adding lemongrass and ginger? Thank you, Lauren! I ended up ordering the mild curry paste I found online. Dish was fantastic, even my picky mom loved it! Charlene, wondered what type of green curry paste did you end up ordering that wasn’t spicy? I’m not able to eat spicy food either. I purchased Pataks Mild Curry Paste, not green but still delicious! What type of green curry paste do you recommend? I’m excited to try this! I use brand called Aroy-D. I get it at my local Asian market. It is vegan, and the Thai Kitchen brand is vegan. As well as a few that you can order on Amazon! WOW!! Just made this for dinner and it is fabulous!! I’m sorry to hear that! You could add some lemongrass and maybe some spicy peppers if you want the spice. I am unfortunately allergic to coconut, do you have a recommendation to sub for the coconut milk? I’m sorry to hear that! You can try a non dairy milk that you like. I recommend something a little thicker like oat milk, cashew or soy. It may not have the exact same flavor, but I think it will still be delicious! I made this last night and my kid who never likes the soups I make said it was bomb! I used almond butter, bone broth, and shredded chicken with veggies. Thank you!!! This looks amazing only problem is I’m allergic to coconut 😔. What would you recommend as a replacement? I would recommend another non dairy milk that you like. Something a little thicker, maybe cashew or oak milk. It may not be quite as creamy, but it should still taste great! AHh!! a fellow coconut allergy, Its so rare to find someone else!! its in everything now! if you try this recipe with any of the alternatives that she recommended, let me know!! Oh man. Long time picture-drooler, 1st time recipe maker here. This ramen was DELICIOUS. So easy and I actually felt like a chef throwing this (zucchini) and that (spinach) in at the very end. Also thanks to the kimchi suggestors! I was almost done with my first bowl when I saw that recommendation, and I stopped eating to plop some kimchi in the remainder of my bowl. So delicious!! Never made ramen before and it was easy. It came out a little thick but I know I can adjust that to my preference next time. Will make again! It is extremely delicious. Amazing. Thanks for the recipe. About 1/4 of the ramen noodles and the broth is a serving size. That is what I usually calculate. Yum! I sautéed mushrooms before adding the ginger and garlic. And added grated carrots and spinach at the end. Needed asome extra heat – I added some red pepper flakes and also served with sriracha. Husband is begging for a repeat! This looks great, can’t wait to make it! What kind of mushrooms did you use? I thinly sliced baby bella mushrooms! Delicious, cheap, and easy! Great meat-eater -friendly vegan recipe. We added marinated tofu and baby bella shrooms. This recipe worked to satisfy that ramen craving. The recipe was relatively quick to make. I liked it a lot, it was light, yet rich and salty enough. I used half a can of low fat coconut milk. I think it would be better with full fat but I know I was saving calories. I would be interested in swapping peanut butter for something else, someone suggested Tahini? peanut butter gave it a very unique spin, delicious but curious what else might work. I used pad thai noodles and that worked fine. This is great quick unique ramen recipe. I didn’t get the spicy though, but I didn’t miss it. I made it. The family of four loved it. I added about 3 times the amount of curry paste (only had red) and some Mother In Law’s Gochujang fermented chile paste concentrate. There was not much left over! THIS IS FABULOUS!!! Have to share my thoughts and dreams about this dish… tastes even better of course the next day. Added half moon thin sliced zucchini and fresh mushrooms, 2 red Thai chilis and upped the green curry paste. Super yummy and filling with brown rice ramen noodles. LOVE THIS ONE!!! Made this tonight. Super easy and quick recipe. It was delicious. Will definitely add to my favorite list. Thank you for all your great recipes especially the blackened tofu and cheesy grits. Wow!! Just finished eating and I’m completely stoked about this recipe. I Did some small adjustments though I added a bit more garlic and I added some mushrooms and Pak Soy. And it was awesome. Thanks!!! I added some sriracha for heat as well as some spinach and crispy baked tofu! I’ve been looking to your website for inspiration the past couple of weeks and haven’t been disappointed yet! You have put together some delicious recipes! LOVE this broth! so delicious and flavorful! It came out more saucy, which I actually liked better because it clung to the noodles better than a watery broth. It would be awesome over rice and veggies too! 5 stars for flavor, speed, and versatility…delicious! Changes I made: full fat coconut milk much too rich, same goes for the peanutbutter, so I subbed light coconut milk and used half dry peanutbutter mixed with water and it substantially reduced the amount of fat in the recipe. It got really thick once the noodles were in, so it needed about a cup more of the broth I used dried, reconstituted shitakes and oyster mushrooms, carrot matchsticks, red onion, cauliflower and frozen peas, and rice ramen from Costco. This one is a keeper! So great! Thank you so much for sharing this recipe 🙂 we just made it and LOVED it. So filling and perfect even for the non-vegan in the fam! Amazing!!!! ! I’m not vegan so I added a teaspoon of fish sauce for umami. Topped with sliced red jalapeño mushrooms cilantro and peanuts! This was SOOO yum! I recommend using either cooking the noodles separately or add extra veggie broth to keep it from getting too thick! My whole family loved this. I have been making plates of vegetables (usu roasted) so people can choose the veggies and then get broth and noodles. My daughter added a hard boiled egg to hers which was good. This is one of my favorite recipes. I’m making this tonight! What veggies do you recommend? Soooooo tasty.. but after the following the recipe exactly my broth came out way too thick as well. So I was wondering if you meant in your instructions that you are supposed to cook the noodles separately and then add them in right before serving ? Because I added my noodles uncooked to the pot and then they took forever to get to that aldente taste.. also I have a electric stove and when I turned it down to simmer it ended up boiling because it takes so long for the heat to lower 🙁 hoping the next time I try it it will be better! Still SO. dang. tasy tho !!! You can use less ramen noodles too. It probably depends on what type of ramen you are using and how long they take to cook. Since the longer they cook the more liquid they absorb. The ones I use only take a minute to cook. Added chopped green onions to ginger & garlic + carrots, red pepper, broccoli. Big spoon of red curry paste because that’s what’s in the house. And when finished, topped with bean sprouts, cilantro and basil. Outstanding!!!! Hi Lauren, this is the first recipe I try to make from your feed and it tastes delicious. One question though.. Is the broth supposed to be really watery/not very creamy? The picture looks quite different in terms of what I had creaminess wise so I kept it cooking for longer etc. Did I do something wrong? Hmmm..I can’t really tell you what happened for sure. It is definitely creamy. I think this is the first time I have gotten that feedback. Did it thicken up as you cooked it? There is a video of the process if that helps at all. It is in my video section! I hope that may help you out! Let me know if I can help in any other way! Sooooo quick and yummy!!! I left out the curry, garlic and onions (fodmap) but added chili flakes, sesame seed oil and rice vinegar. Plan on freezing some of the broth for quick future lunches! Very delish! I’ve made this quite a few times now and it’s always a hit with my friends. I just made this for my family tonight and it was a hit! Really tasty and satisfying. Only thing is the broth got a bit thick. Next time I’ll add less noodles and more vegetable broth. Thank you for the delicious recipe! !